June is a time for many schools to celebrate special occasions and tributes with accolades and awards. Part of the successes are due to great academics, disciplines and the department heads who instill, inspire and lead many classes to graduate with honors. Rigor and challenge are what make a school and it's staff as well as students thrive. 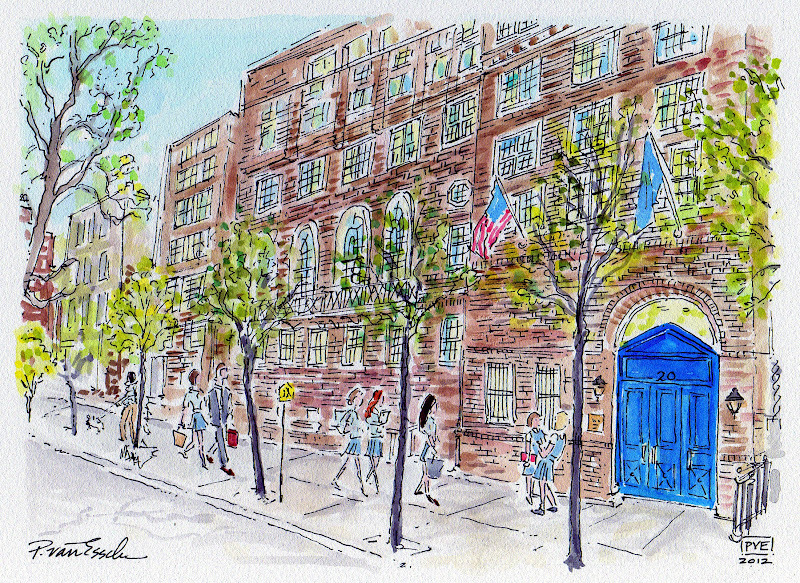 Loving and supportive parents also help as the school years require collaborative efforts. 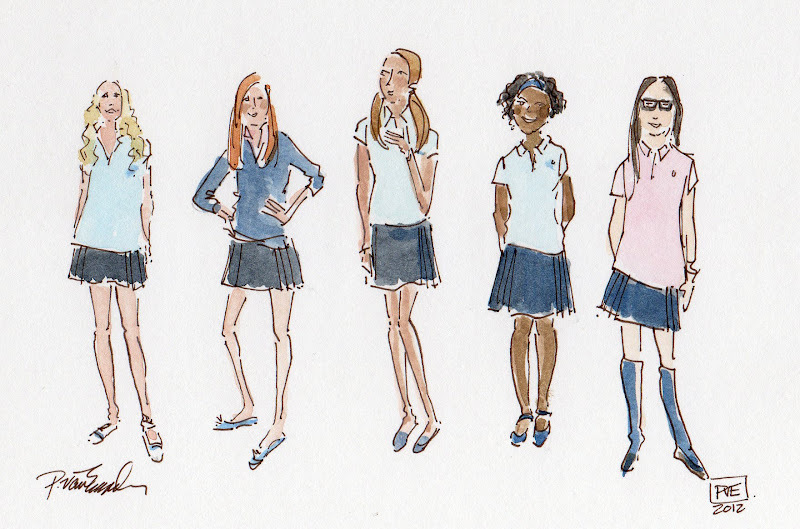 Can you spot the uniforms, the first sketch I felt the uniforms were too light so I added a darker navy blue and felt very pleased in the illustration below. 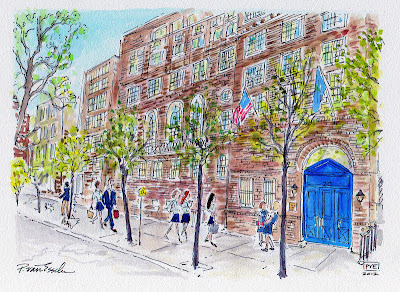 A recent framed commission of this elite school in New York city was given to a departing school director, after many years of dedication and service. Read these ten things from her departing speech. Just stellar departing words of wisdom. Do you start to get the school blues with all the special year end celebrations and speeches from graduates and special staff stepping down after being such integral parts of one's environ? June is such a journey at every institution. Good luck to all the students, graduates and staff at all the many institutions all over the world this June. Thank-you little Augury for your kind words. I can always count on you to light up my day. Thanks for your comments and support of my work. It is a special time of year - I remember the times fondly both for me and my brother. Your pieces are beautiful. Beautiful illustrations...I love the list of ten...so true! In 17 days my daughter will graduate and I'm so thankful for the lessons she has learned and taught us and for all her educators that have made a difference in who she is today. Have a wonderful Tuesday! What a wonderful way to remember a time in your life and your illustation is beautiful. 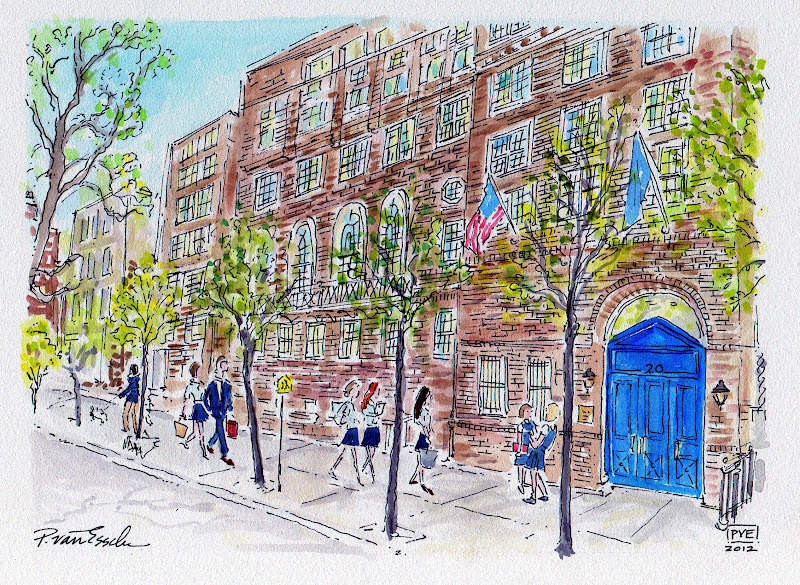 I remember graduating schools fondly but it's usually the start of school I miss most. Perfect timing! Today we had my oldest son's "moving up" ceremony. He just finished 4th grade and will be moving into the Middle School next year. I love how they took time to honor the growth of the students and the dedication, time and energy from their teachers. I'm sure that special headmistress was thrilled with her commission of a pve! you for bringing me to such a warm memory. I love the art work and know the place well! I found the list of ten things so fabulous I added it in a PS to a post of mine today - I hope that is ok? Quite fabulous as always! You are so talented my kind friend! Love the speech as well! I looked at the girls and thought Nightingale! I adore these - adore them! 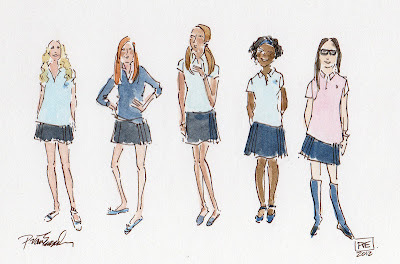 Beautiful illustrations and I love the navy skirts! I adore the one with all the variations of the uniforms...such a big part of their years in school. Girls have such a way of tweaking their uniform just enough to show their style, but not get a demerit. I guess my son does that too, but not like the girls. They will love this! And the list of ten things...brilliant!